Whether functional, classic or unusual. FIND YOUR WESTERN BOOTS THAT SUIT YOU! Unusual booties for unique women. Always chic and trendy with a classic ankle boot. Looking for a pair of elegant and comfortable business shoes? functional and comfortable Biker Boots. Stylish Cowboy Hats for Ladies and Gents. Reinvent yourself yourself with our wide range of belts! Here you will find everything that makes a Cowboy or Western Fan heart beat faster. Here you will not only find Boots made from the finest leathers but they also look great and are comfortable to wear. Not only do our Boots protect you from the elements, but make you look great on a horse saddle but also at work. We at Fashion Boot take great pride in our boots due to their high quality making them a great companion that will accompany you over the years. We pay the utmost attention to details such as comfort, functionality and the fashion aspect. Each Boot is made with the finest leather and our love for detailing. This detailing becomes apparent in our designs and choice of colors. This combination nakes our Boots attractive and reliable fashion accessory. Make your love ones feel special! Your data will in no case be passed on to third parties. You can unsubscribe anytime free of charge. You can find the contact details for this purpose in ourm imprint. Discover over 800 different boots in our shop. We have everything that will capture the hearts of cowboys or Western fans. Discover high quality boots from the finest leather in different varieties that are not only class to look at but are also game for anything. With our boots, you can successfully defy the wind and weather, sit tight in the saddle on one or more horsepower and also cut a fine figure in the workplace. We at Fashion Boots have high quality standards, making our shoes faithful companions that you can fully rely on. We focus on extraordinary wearing comfort and functionality and certainly with no compromise on the fashion aspect. Hand-crafted leathers and attention to detail that comes through in filigree trims and an attractive colour selection, gives that unbeatable mix that is our versatile fashion boots. Take a look at what we have to offer and find your favourite model. And our range is just as versatile as our boots. You will be amazed at the wide range of cowboy boots, biker boots, western boots and classic riding boots and other fashion trendy styles! Here you can choose classic and traditional models, or maybe go for fashionable extravagance with a high recognition value. Our work and engineers are extremely hard-wearing and impress with their timeless, rustic look. Our selection of shoes means there is something for ladies, gents and children and the latter can feel like Lucky Luke with our children's cowboy boots. Our shop carries only top brand quality with a host of famous names, including Sendra Boots, Tony Mora, El Estribo and Buffalo Boots. So there is something to suit every taste. Every outfit is enhanced by an appropriate accessory and this style rule also applies to cowboy boots! So we also feature a wide selection of trendy leather belts, that perfectly complement your look. Here too we offer a wide variety of brand names, so you are guaranteed to find a belt to match your new boots. 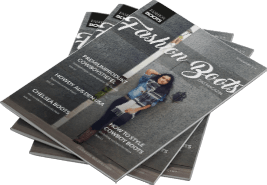 If you have any questions about our models or need personal advice, the team at Fashion Boots are only a phone-call a way and are ready to provide you with advice and assistance. After all, they have over 20 years of experience with exclusive leather fashion. We look forward to hearing from you! There are still no items in the shopping basket.